For many people, their bedroom lighting project appears to be a simple task. You need a light that properly illuminates the room to avoid stubbing a toe and you need that light source to shut off so you can spend the majority of the time there sleeping. It may prove very beneficial, however, to invest the time and energy into finding quality home lighting fixtures for your bedroom. As a sanctuary for rest and relaxation, the bedroom is actually one area that can benefit from adhering to a quality lighting plan. 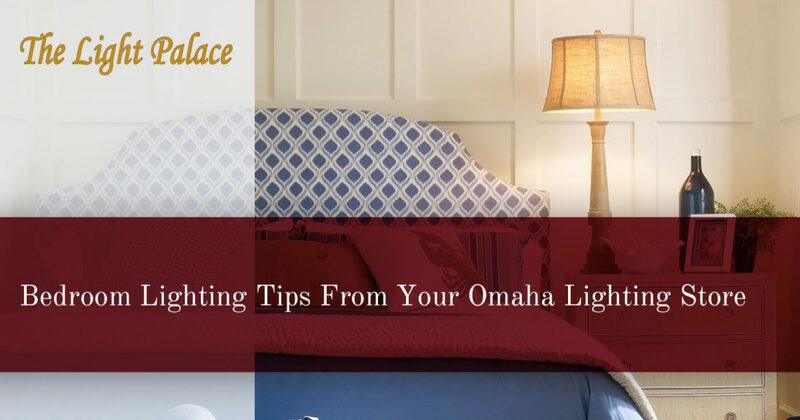 When planning a lighting scheme for your home, it can prove to be very helpful to gain help from your local lighting store in Omaha. The Light Palace is your source for residential lighting solutions, featuring an experienced staff and comprehensive showroom. Finding modern lighting designs ands applications for the bedroom can prove to be a challenge. It can be helpful to break the task down into each type of lighting: general, task, and accent. Today, we’ll look at a few tips based on these lighting types and how they can optimize your space. When you’re ready, be sure to stop by our Omaha lighting showroom in person or online to begin! The general lighting that envelops your bedroom is very important for your day-to-day operations. Generally, flush-mount lighting placed in the center of the room will do wonders for illuminating your tasks, from dressing for the day to finally picking up the dirty laundry. In many rooms, a floor lamps provide enough light to get the job done. Based on how much natural light is available, you can choose a lower wattage bulb to provide a gentle shade for your activities. The bedroom is meant for winding down, and utilizing a bright light can affect your sleep negatively.Semi flush-mount fixtures are also helpful to suit your general lighting needs. The level of task lighting you’ll need varies based on individual needs. For people who spend a lot of time reading, a pendant or table lamp can provide enough focused light. Utilizing a task fixture with a bright output can also prove beneficial for those who write or pay bills in this space. A wall light can help to provide task lighting for changing clothing or even putting on makeup. The demand of task lighting depends on your intended use of the bedroom, whether it be only for sleeping or writing the next great novel. Our lighting experts can help in planning your bedroom lighting elements, tailoring a plan that lights your space perfectly. Highlighting fixtures can be helpful for really setting the mood and tone for your bedroom. Beyond the general lighting’s illumination, accent fixtures can provide the perfect glow whenever it is needed. Many people take the opportunity to include wall lights that highlight family photos, favorited art pieces, signed sports paraphernalia, illuminate your keys’ storage area, and more. Any important decor that you are proud of can be highlighted on the wall for enjoyment at your leisure. When combined with other mood-setting elements, the end result can be a dynamic display of relaxation or productivity. A dimmer switch can be very beneficial here, as being able to set the brightness really gives the user all of the power for how to light the room. Other fun features such as electronic candles or string lights can be used accordingly to illuminate your space in a personal, comfortable fashion. As the bastion of privacy, your room should match your style and unique preferences in nearly every way. We advise caution at this stage, though, as balance is important to keep the serenity of any space. If you install too many lighting fixtures in a small area, the result can be a chaos of washed-out surfaces and a stressful experience. The Light Palace is proud to be your Top Rated Local® lighting store in Omaha, providing Nebraskans with the best lighting solutions for more than half a century. If your room is in need of an exciting upgrade, be sure to stop by our expansive showroom to find the best advice and products in stock. With honest staff and quality services, you’re sure to be satisfied with the results. Stop by to begin or contact us now for answers to your questions!